Written by: Greg Zelnik on January 23, 2013.on January 31, 2013. Most children like Educational School Assemblies, which focus on Education, and Teaching with Magic. When you tell a child that we are going to be doing some magic today you instantly have their attention. When we can weave educational material in with the magic, the children get to learn. They are intently listening, while they are having fun. It is always interesting to get feedback from the students, on what they learned and remember from am Educational School Assembly. 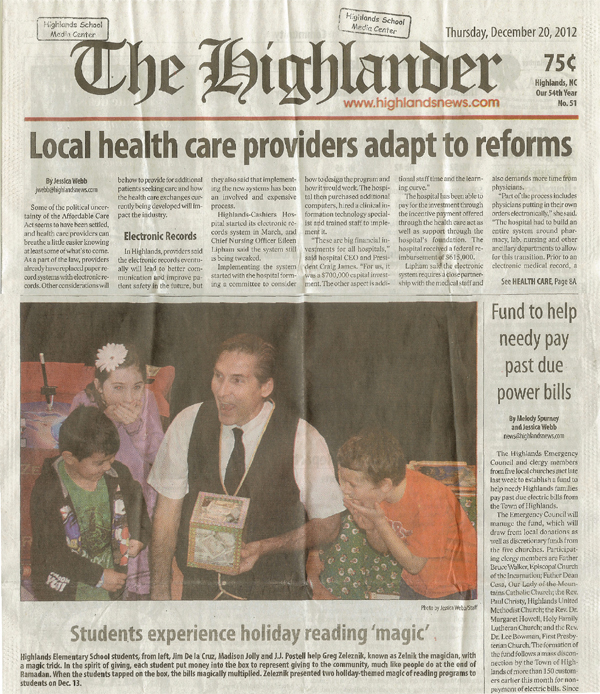 It is always, interesting, a little surprising, and inspiring to know that teaching with magic can be important enough to make the front page. It may be because of the students’ reaction, it may be because educational presentations using magic are not a common occurrence, or it may be because there just was not that much happening that day. Whatever the reason, it is nice to see that more people are aware of the fun learning experience that children get to have while at school. Most children like magic. When you tell a child that we are going to be doing some magic today you instantly have their attention.